It would appear that the tragic death of Sergei Magnitsky is being resolved in a slow but deliberate fashion, and I have little doubt that the latest indictments of the medical personnel who were responsible for his health while he was in detention, will be followed by further criminal indictments. The West’s posturing in this matter can add nothing of benefit to this process, for it needs to proceed divorced of political pressure if it is to have any lasting impact on the Russian justice system. That is one reason why I believe that efforts from outside Russia to punish its government officials in the Magnitsky case are seriously misguided. Two more are that they directly undermine Russia’s efforts to improve its judicial and penitentiary system, and that they heedlessly damage relations with a vital strategic partner of the West over issues where there is no real disagreement on the desired outcome. They undermine domestic reform efforts by casting doubt on the integrity of the entire judiciary system and painting all senior officials, as well as thousand of honest and hard working civil servants, with a single brush. 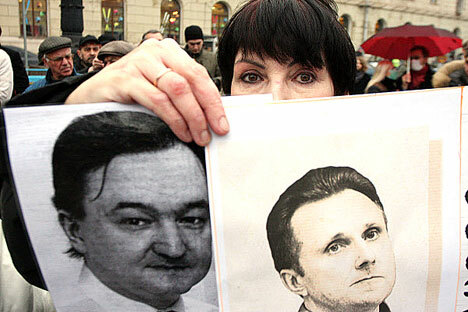 This was a conscious strategy chosen by Putin’s most vocal critics, who chose to make Magnitsky’s tragic death a cause célèbre because it combined a devastating example of the persistent inadequacies of the Russian penitentiary system with the public notoriety of the Khodorkovsky case, albeit without the latter’s rather shady past. This proved to be an ideal combination for turning a personal tragedy into an vilification of Russia’s entire system of government. The problem with this strategy is that it is self-destructive. Ultimately, the leaders of the radical liberal opposition (Nemtsov, Ryzhkov, Kasyanov, Kasparov) do not seek to remove incompetent individuals, but to overthrow “the system.” Competent government and effective application of the rule of law would only serve to validate what they call “the Putin Regime,” which they regard as illegitimate. Like the 19th century radicals before them they tolerate no compromises with the existing government, excommunicating anyone who is willing to work within the system to actually improve people’s lives—Kirov governor Nikita Belykh being a noted case in point. What they do not realize, however, is that by undermining the legitimacy of Russia’s governmental and legal institutions, they undermine themselves, for it leads to some rather obvious questions: If the institutions themselves are flawed, then how will electing new leaders change anything? On the other hand, if the institutions themselves need to be transformed, then what is being proposed is another social, economic, and political upheaval. It is precisely because radical liberals have never been able to talk straight to the Russian people about their true intentions that, despite widespread name recognition, they have hardly every gotten more than 5% of the vote in the scores of elections (local, regional and national) in which they have taken part during the past decade. In addition, critics of Russian reform in the West fail to understand that discrediting Russia’s established institutions is also highly destructive for the West. It damages relations by conveying the mistaken impression that the country can be manipulated through external pressure. This has not been the case for more than a decade, or since Russia paid off the last of it foreign debts. It is worth bearing in mind just how much better off Russia is today than any western economy—not only does Russia have no debt to speak of, it has $24 in cash to cover each dollar the government plans to borrow (Ben Aris, “Rerating Russia,” Business Week Europe, April 8, 2010)! This has allowed it to expand social spending at a time when Western economies are implementing draconian cuts. We have a seriously distorted view of the geopolitical relationship that is currently emerging, which is actually between a rising Russia that is strategically aligned with China, and an increasingly weak and uncertain West, which cannot survive in its present form without access to Russia’s strategic resources. Second, the persistent failure of major Western institutions to acknowledge the enormous progress that Russia has made over the past two decades has so distorted the public’s image of Russia, that straightforward and honest relations with it have become almost impossible (and when Putin tried to address this issue at the 43rd Munich Security Conference in 2007, he was condemned for his efforts). Russian security concerns are dismissed as remnants of Cold War thinking, rather than genuine issuess; Russian stocks are grossly undervalued by Western rating agencies (though not by their Chinese competitor Dagong), leading to a politically skewed view of the Russia’s investment potential. All this is accompanied by the heady but entirely unjustified notion that Russian leaders will somehow be subdued by stern Western warnings about a “values gap” that does not even exist! Paradoxically, in this era of constant contact we seem to be moving ever farther from understanding the true state of affairs in Russia. The recent scandal surrounding the award of the German Quadriga Prize to Vladimir Putin, later rescinded because of what the private group calls “increasingly unbearable pressure,” is but the latest example of how far Western perceptions of Russia have become from its everyday reality. Is it any surprise, in this context, that most people here suspect the only reason that the Magnitsky case is of any importance to Russia’s radical liberals is that it plays well in the West? There is no quick way to alter such deeply entrenched perceptions, but there are a few steps that could be taken to improve our dealings with Russia. First, respect the sincerity of those in the Russian government. Common decency would dictate that one should not judge those in power until you have walked in their shoes; common sense that one should not condemn the entire civil service for the actions of a few civil servants. Second, honor the ideal of institutional autonomy. If we start with the recognition that all nations fail in some fashion to honor their ideals, then punishing each other’s failure can only lead to a vicious and destructive cycle of mutual recrimination that would quickly make the Cold War seem like a pleasant respite. Nicolai N. Petro is Professor of political science at the University of Rhode Island.